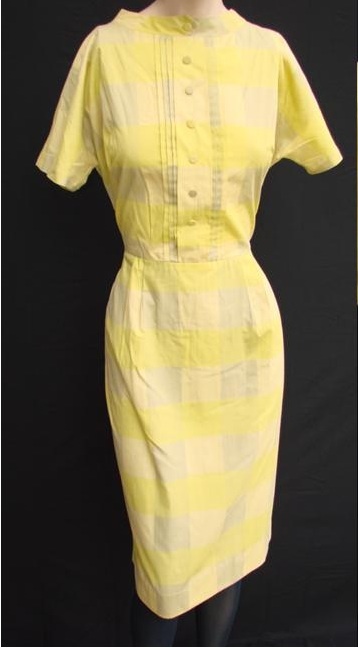 That's supposed to be a big 50s shirtdress. Someday. For now, it's waiting patiently in a big pile (which is why it's so wrinkly). This I *can't wait* to sew — I bought it at Joann's, of all places (nonUSians: JoAnn's is a giant chain store that lately has been more crafty than fabric-y). When I was having it cut (I bought everything left on the bolt, natch, about six yards) four people came up to me and asked me what I was going to make. "A *BIG* dress," I said. Of course, I am still trying to find the perfect "BIG DRESS" pattern for this. And deciding what to line it with. I want pale gray batiste, which I don't think exists (or at least, doesn't exist at a price I'm willing to pay, and I'm not going to dye white batiste, either). 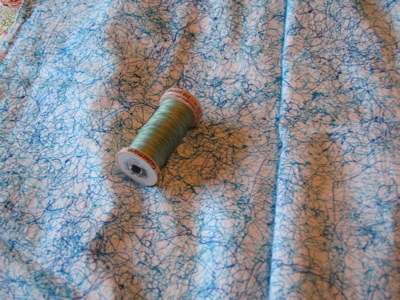 So that's what's hanging out in my fabric stash, clamoring to be made … and keeping me from buying more fabric online! It’s fun when you show us the fabrics and patterns you have piling up, waiting for you to get to them. I am in awe of how your creative imagination,inspired by particular fabrics, churns out so many wonderful dress ideas. But what boggles my mind is imagining what your closet must look like, with all those dresses and skirts that you *have* made. How many linear feet of closet-rod space do they occupy, anyway? How many acres is that closet? Have you just annexed the adjoining city block to house all your productions, or what? I hope this doesn’t sound like a rude question; I am truly wondering how this works. I’m new here, so I don’t know your size or your complete pattern stash, but I have a great “big dress” pattern (and I have two of them because I was going to mail one to a friend). Then you can tell me what to do with my black daisy lace. I love the orange/blue/green dots so much! 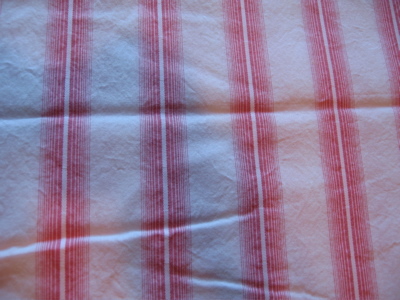 I should do this, take pics of my fabric and their corresponding patterns. Then maybe I can stop myself from buying so much fabric. 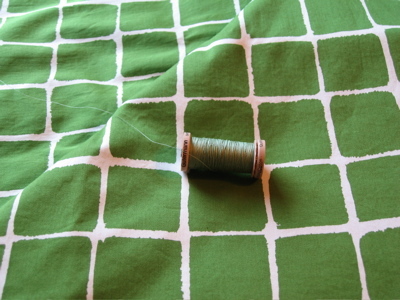 I see the green fabric with white “graph” lines as a simple little strappy sundress. You could make the straps in white or green or and then use white for the patch pockets possibly? With a thin red piping I think it’d look pretty zippy! Just a thought. Oh! Oh! That white eyelet…I can see it as the skirt part of one of this big-skirted 50s dresses…you know, the kind with the closely fitting top and huge circle skirt. 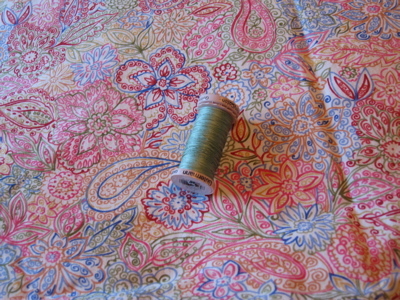 I would use this for the skirt, and make the top part in a plain white batiste or broadcloth. Glad I’m not the only one with WAY more ideas than time. Erin, I wouldn’t normally dispute your choice, but I’m a trifle dubious about lining the eyelet with a pale grey batiste; I have visions of the overall impression being more Isabelline than anything – just an overall impression, from a distance, of a certain … grimeyness. I would vote for peach, or pink … or mustard!! With a matching mustard belt.And I love the flowery fabric destined for a skirt.Anonymous, it’s my belief that Erin actually has access to a Tardis of her very own, and that’s where her clothes are stored. I’m very, very jealous. I like the Mustard lining instead of gray batiste. Also, was thinking what about a long dress a la talitha getty? for the eyelet? Maybe it would look a bit too much wedding-y, but she had these gorgeous long flowy dramatic dresses. 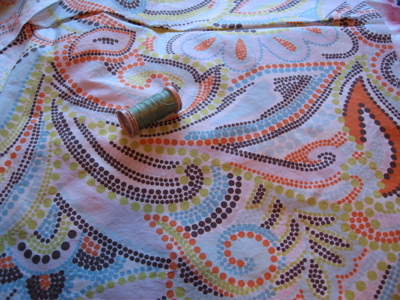 I looooove that last green and white fabric. It reminds me of alligators and would indeed make an excellent wiggle dress. Love love love the eyelet!!! So pretty. 🙂 I definitely see it as a dress – maybe with an A-line skirt and a fitted bodice? la belladonna: Ah, her own Tardis. That would explain it. Either that, or a closet something like No. 12 Grimmauld Place in Harry Potter: small (well, invisible in HP) outside, huge inside. Only not so, you know, Grim and Old. I sometimes think i should label myself “a collector of fabric, that i occassionaly take out and dream about” rather than a sewer as I seem much better at the former. i even dreamed up a lovely display area in my sewing room to stock them before tackiling a better work surface. Maybe you already know about this, but I haven’t heard you rave about it, so maybe not. But if you’re looking for a big dress pattern, you could try the Vintage Pattern Lending Library (http://www.vpll.org/). It’s pretty nifty! If you really really want grey batise, just buy white and wash with a pair of jeans.That’s the quickest way I know to turn anything grey. Believe me, I’ve had loads of experience with this…not by intent however. Hot dog mustard yellow brings back the memory of the dresses my mom sewed for my two sisters and myself. 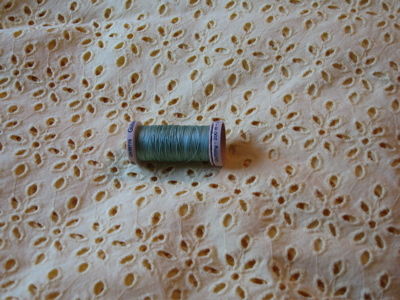 The fabric was hot dog mustard yellow with tiny black flowers- I guess it was calico. We are all different: blond with blue eyes, dark brunette with brown eyes and mousy brown with brown eyes (me). That color yellow was unflattering to all of us. How we hated those dresses- especially my youngest sister who had to wear our dresses as we outgrew them-lol.